If you're interested in finding out the full power and potential of your graphics card, then give it a benchmark test with FurMark. 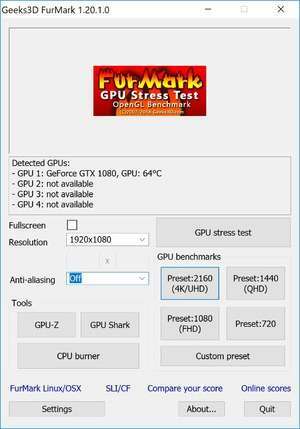 FurMark stress tests your graphics card with many 3D graphics tests to see whether it is capable of handling some of the tasks required by modern gaming engines. With FurMark you can perform different tests with different options. After testing has finished, FurMark will display a score. Version 1.20.5.0 is a freeware program which does not have restrictions and it's free so it doesn't cost anything. FurMark download been highly rated by our users.